The holidays are right around the corner which means one thing, winter is coming! The city of Columbus turns into a winter wonderland during this time of year, as Christmas lights and joy spread throughout Downtown and The Short North. With the cold brisk days, it can be challenging to find fun activities to do! Hey, don’t get us wrong. If we could binge-watch Netflix everyday of the week, we would. 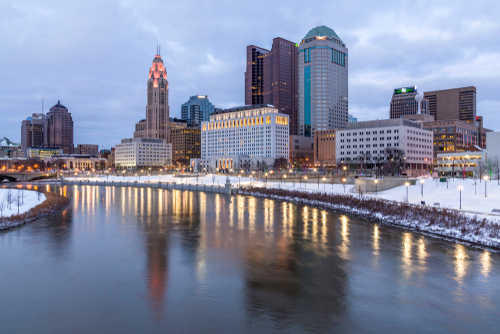 Once cabin fever sets in, try these fun winter activities in Columbus, Ohio! What better way to get some laughs and exercise than with ice skating?! Ohio Health Chiller Ice Rinks offers four locations, allowing you to choose the one closest and most convenient to you. It’s open to the public, so gather your friends and family and hit the ice! The Columbus Museum of Art is celebrating their 140 years of sharing a creative space with the city of Columbus! Join them this winter for their art galleries exhibitions in honor of their continuous hard work in the art community. They even have a museum store and cozy cafe to relax in after browsing the artwork. Surprise your loved one with tickets to a show at the Ohio Theater this winter. The Nutcracker is a performance loved by many, and tickets are on sale now! If the Nutcracker isn’t your preferred interest, keep an eye on future shows as the Ohio Theater is always keeping things interesting. Going to a concert is the best way to express yourself with no worries attached. Express Live has a solid lineup of artists for the upcoming months, bound to host a band you love. Browse their future shows to see if a band catches your eye. Whether you’re into alternative, punk, pop, or jazz, there’s something for everyone! Plan a night out with friends while singing at the top of your lungs – you deserve it. Hey, it is winter. That means comfort food is to be enjoyed and savored by all! Be sure to stop by Arch City Tavern after a day of ice skating or viewing art to warm up with cozy cocktails and house made dishes. Whether you’re craving some braised pork sliders or hot french onion soup, we have exactly what you’re looking for. Come see us! Browse the Arch City Tavern menu to prepare your next visit. We offer Happy Hour Monday-Thursday 3PM to 6PM…see you there! No Replies to "Winter Activities in Columbus, Ohio"